Trust No. 85-1098 Rockford, Illinois, (hereinafter referred to as the “Declarant”). WHEREAS, Declarant desires and intends that the several owners, mortgagees, occupants and any other persons hereafter acquiring any interest in said Property shall, at all times, enjoy the benefits of, and shall hold their interests subject to the rights, easements, privileges and restrictions hereinafter set forth, all of which are declared to be in furtherance of a plan to promote and protect the cooperative aspect of such Property and are established for the purpose of enhancing and perfecting the value, desirability and attractiveness of the Property. (a)	“Act means the “Condominium Property Act” of the State of Illinois. (b)	“Declaration” means this instrument by which the Property is submitted to the provisions of the Act, as hereinafter provided, and such Declaration as from time to time amended. (c)	“Parcel” means the tract of real estate legally described above in this Declaration, which is hereby submitted to the provisions of the Act. (d)	“Property” means all the land, property and space comprising the Parcel, and all improvements and structures erected, constructed or contained therein, or thereon, including buildings and all easements, rights and appurtenances belonging thereto, and all fixtures, equipment and furnishings intended for the mutual use, benefit or enjoyment of the Unit Owners, submitted to the provisions of the Act. (e)	“Unit” means a part of the Property, including one or more rooms and occupying one or more floors or a part or parts thereof, designed and intended for independent use as a one-family dwelling, as set forth on the Plat of Survey attached hereto as Exhibit B, which Plat is being recorded simultaneously with the recording of the Declaration. The legal description of each Unit shall consist of the identifying number or symbol of such Unit as shown on Exhibit B. Every deed, lease, mortgage or other instrument may legally describe a Unit by its identifying number. Each Unit shall consist of the space enclosed and bounded by the horizontal and vertical planes constituting the boundaries of such Unit as shown on the Plat; provided, however, that no structural components of a Building, and no pipes, wires, conduits, ducts, flues, shafts, or public utility lines situated within a Unit or within the floors, ceiling or perimeter or interior walls of the Unit and forming part of any system serving more than one Unit or the Common Elements shall be deemed to be a part of said Unit. (f)	“Common Elements” means all the Property, except the Units, and shall include, but shall not be limited to, the land, foundation, entrances and exits, common parking areas, storage areas, roof, incinerator, pipes, ducts, electrical wiring and conduits (except pipes, ducts, electrical wiring and conduits situated entirely with a Unit and serving only said Unit), central heating and air-conditioning system, public utility lines, floors, ceilings and perimeter walls of Units (other than such portions thereof included within Unit boundaries shown on the Plat), structural components of the Buildings, outside walks and driveways, landscaping, and all other portions of the Property except the individual Units. Structural components located within the boundaries of a Unit shall be part of the Common Elements. (g)	“Limited Common Elements” means a portion of the Common Elements reserved for the exclusive use of and serving exclusively a single Unit or adjoining Units as an inseparable appurtenance thereto, including specifically, but not by way of limitation, driveways, balconies, patios, terraces and such portions of the perimeter walls, floors and ceilings, doors, windows and entryways, and of all associated fixtures and structures therein as lie outside the Unit boundaries. The Board may from time to time designated other portions of the Common Elements as Limited Common Elements. A valid exclusive easement is hereby declared and established for the benefit of each Unit and its owner, consisting of the exclusive right to use and occupy the Limited Common Elements, however, that (except as constructed or permitted by the Declarant or the Developer) no Unit Owner shall decorate, or fence, enclose, alter or adorn such Limited Common Elements without the prior written consent of the Board of Directors. (h)	“Person” means a natural individual, corporation, partnership, trustee or other legal entity capable of holding title to real property. (i)	“Unit Owner” means the person or persons whose estates or interest, individually or collectively, aggregate fee simple absolute ownership of a Unit. (j)	“Majority” or “Majority of the Unit Owners” means the owners of more than 50% in the aggregate in interest of the undivided ownership of the Common Elements. Any specified percentage of the Unit Owners shall mean those Unit Owners who, in the aggregate, own such specified percentage of the entire undivided ownership interest in the Common Elements. (k)	“Unit Ownership” means a part of the Property consisting of one Unit and the undivided interest in the Common Elements appurtenant thereto. (l)	“Building” means the building or buildings located on the Parcel and forming part of the Property and containing one or more Units, as shown by the survey depicting the buildings. (m)	“Parking Area” means any part of the Common Elements provided for parking automobiles as shown or referred to on the Plat. (n)	“Parking Space” means a portion of the Property within the Parking Area intended for the parking of a single automobile. (o)	“Developer” means Today’s Bank-East, as trustee of its Trust 85-1098, and any successor to its entire interest in the Property other than the purchaser of an individual Unit. (p)	“First Mortgagee” means a person, bank, savings and loan association, insurance company or other entity, which, or who, owns and holds a first mortgage, or first trust deed, with respect to any portion of the property. (q)	“Occupant” means a person or persons, other than a Unit Owner, in possession of a Unit. ARTICLE 2. Submission of Property to the Act. The Declarant, as the owner in fee simple of the Parcel, expressly intends to and, by recording this Declaration, does hereby submit the Parcel and the Property to the provisions of the Act. ARTICLE 3. Plat. The Plat attached hereto as Exhibit B, and incorporated herein by reference, sets forth the measurements, elevations, locations and other data, as required by the Act, including the Parcel and its exterior boundaries and each Unit of each of the Buildings. ARTICLE 4. Identification of Unit and Limited Common Elements. Each Unit and Limited Common Element is identified on the Plat by a distinguishing number or other symbol. The legal description of each Unit in every deed or other instrument shall refer to such identifying number or symbol. Except as otherwise provided by the Act, no Unit Owner shall, by deed, plat or otherwise, subdivide or in any other manner cause his Unit to be separated into any tracts or parcels different from the whole Unit as shown on the Plat. In the event a Unit Owner desires to combine two adjoining Units which he owns, he need not obtain the consent of other Unit Owners, but shall obtain the consent of the Board of Directors of the Association, as hereinafter defined. (a)	The administration of the Property shall be vested in a Board or Directors consisting of the Persons who shall be elected in the manner provided in the By-laws attached hereto as Exhibit D and incorporated herein by reference. The Developer, after the recording of this Declaration, shall cause to be incorporated under the laws of the State of Illinois a not-for-profit corporation (hereinafter referred to as “the Association”) under the name of “The Condominiums of Springbrook”, or a similar name, which corporation shall be the governing body for all of the Unit Owners for the operation of the Common Elements and for such other purposes as are hereinafter provided. The Board of Directors of the Association shall be deemed to be the Board of Managers referred to in the Act; which is sometimes referred to herein as the “Board”. (b)	The duties and powers of the Association and its Board shall be those set forth in its Articles of Incorporation, the By-laws and this Declaration; provided, however, that (i) the terms and provisions of the Act shall control in the event of any inconsistency between the Act and this Declaration, the Articles of Incorporation and the By-laws, and (ii) the terms and provisions of the Declaration shall control in the event of any inconsistency between this Declaration and the Articles of Incorporation and the By-laws. Irrespective of anything else in this Declaration, the Developer shall be entitled to exercise the powers of the Board as provided in the Act, this Declaration and the By-laws, for a period commencing upon the recordation of this Declaration and terminating upon the qualification of the directors elected at the initial meeting of the Association. (c)	Every Unit Owner shall be a member of the Association, which membership shall terminate upon the sale or other disposition by such member of his Unit Ownership, at which time the new Unit Owner shall automatically become a member therein. Each Unit Owner agrees to be bound by and observe the terms and provisions of the Association’s Articles of Incorporation, By-laws, and rules and regulations. (d)	The Association shall not be deemed to be conducting a business of any kind, and all funds received by the Association shall be held and applied by it for the benefit of the Unit Owners in accordance with the provisions of this Declaration and the By-laws. The aggregate number of votes for the Association shall be one hundred, which shall be divided among the respective Unit Owners in accordance with their respective percentage of ownership interest in the Common Elements as set forth in Exhibit C hereto. (e)	There shall be one person with respect to each unit Ownership who shall be entitled to vote at any meeting of the Unit Owners. Such person shall be known (and hereinafter referred to) as a “voting member”. Such voting member may be the Unit Owner or one of the group composed of all of the Unit Owners of a Unit Ownership, or may be some person, designated by such Unit Owner or Unit Owners to act as proxy on his or their behalf and who must be a Unit Owner. No person may act as a proxy for more than 5 votes. Such designation shall be made in writing to the Board and shall be revocable at any time by actual notice to the Board of the death or judicially declared incompetence of any designator, or by written notice to the Board by the Unit Owner or Unit Owners. Any or all of such Unit Owners may be present at any meeting of the voting members and (those constituting a group acting as a single voting member) may vote or take any other action as a voting member either in person or by proxy. However, a voting member or his proxy shall not be entitled to vote or considered for purposes of a quorum if he is delinquent in his assessment. The total number of votes of all voting members shall be 100, and each Owner or group of Owners shall be entitled to the number of votes equal to the total of the percentage of ownership in the Common Elements applicable to his or their Unit Ownership as set forth in Exhibit C. Declarant shall be the voting member with respect to any Unit Ownership owned by the Declarant. When thirty percent or fewer of the Units, by number possesses over fifty percent in the aggregate of the votes in the Association, any percentage vote of members specified herein or in the Declaration shall require the specific percentage by number of Units rather than by percentage of interest in the Common Elements allocated to Units, which would otherwise apply. ARTICLE 6. Indemnity. The members of the Board and the officers thereof or of the Association, or the Developer when exercising the powers, rights, duties and functions of the Board, shall not be liable to the Unit Owners for any mistake or judgment or any acts or omissions made in good faith on behalf of the Unit Owners or the Association unless any such mistakes, acts or omissions shall have been made in bad faith or contrary to the provisions of this Declaration. The liability of any Unit Owner arising out of any contract made by such members, officers or the Developer or out of the aforesaid indemnity shall be limited to such proportion of the total liability thereunder as his percentage interest in the Common Elements bears to the total percentage interest of all of the Unit Owner in the Common Elements. Each agreement made by such members or officers or the Developer or the managing agent, as the case may be, as agents for the Unit Owners or for the Association. ARTICLE 7. Board’s Determination Binding. In the event of any dispute or disagreement between the Unit Owners relating to the Property or any question of interpretation or application of the provisions of the Declaration or By-laws, the determination thereof by the Board shall be final and binding on each and all of such Unit Owners. ARTICLE 8. Ownership of the Common Elements. Each Unit Owner shall be entitled to the percentage of ownership in the Common Elements allocated to the respective Unit owned by such Unit Owner, as set forth in the schedule attached hereto as Exhibit C and incorporated herein by reference. The aforesaid percentages of ownership interest have been computed and determined in accordance with the Act, and shall remain constant unless hereafter changed by recorded Amendment to this Declaration in accordance with this Declaration or consented to in writing by all Unit Owners. Said ownership interests in the Common Elements shall be undivided interests, and the Common Elements shall be owned by the Unit Owners as tenants in common in accordance with the respective percentages of ownership as set forth in Exhibit C. No Unit Owner shall bring any action for partition or division of the Common Elements. The ownership of each Unit and of the Unit Owner’s corresponding percentage of ownership in the Common Elements shall not be separated. ARTICLE 9. Use of the Common Elements. Each Unit Owner shall have the right to use the Common Elements (except the Limited Common Elements) in common with all other Unit Owners, as may be required for the purposes of access, ingress and egress to, and use, occupancy and enjoyment of the respective Unit owned by such Unit Owner. Such right to use the Common Elements shall extend to each Unit Owner, and the agents, servants, tenants, family members and invitees of each Unit Owner. Each Unit Owner shall have the right to the exclusive use and possession of the Limited Common Elements exclusively serving his Unit. Such rights to use and possess the Common Elements, including the Limited Common Elements, shall be subject to and governed by the provisions of the Act and of this Declaration and the By-laws herein and the rules and regulations of the Board. The Board shall have the exclusive authority from time to time to adopt or amend administrative rules and regulations governing the use, occupancy and control of the Common Elements as more particularly provided in the By-laws. The Board shall have the authority to lease or to grant licenses or concessions with respect to parts of the Common Elements, subject to the provisions of the Declaration and By-laws, including specifically, but not by way of limitation, common parking areas. ARTICLE 10. Common Expenses. Each Unit Owner shall pay his proportionate share of the expenses of administration, maintenance, operation, insurance and repair of the Common Elements and of any other expenses incurred in conformance with the Act, Declaration and the By-laws or otherwise lawfully agreed upon (which expenses are herein sometimes referred to as “Common Expenses”). Such proportionate share of the Common Expenses for each Unit Owner shall be in the same ratio as his percentage of ownership in the Common Elements. Payment thereof shall be in such amounts and at such times as determined in the manner provided in the By-laws. If any Unit Owner shall fail or refuse to make any such payment of the Common Expenses due, the amount thereof, together with any interest, late charges, reasonable attorney’s fees incurred prior to initiation of court action and costs of collection, shall constitute a lien on the interest of such Unit Owner in the Property as provided in the Act. ARTICLE 11. Separate Mortgages. Each Unit Owner shall have the right, subject to the provisions herein, to make a separate mortgage or encumbrance on his respective Unit together with his respective ownership interest in the Common Elements. No Unit Owner shall have the right or authority to make or create or cause to be made or created any mortgage or encumbrance or other lien on or affecting the Property or any part thereof, except to the extent of his Unit and his respective ownership interest in the Common Elements. ARTICLE 12. Separate Real Estate Taxes and Utilities; Default in Sanitary Sewer Charges. It is understood that real estate taxes, special assessments and any other special taxes or charges are to be separately taxed to each Unit Owner for his Unit and his corresponding percentage of ownership in the Common Elements, as provided in the Act. In the event that for any year such taxes are not separately taxed to each Unit Owner, but are taxed on the Property as a whole, then each Unit Owner shall pay his proportionate share thereof in accordance with his respective percentage of ownership interest in the Common Elements. Each Unit Owner shall pay for his own telephone, electricity and other utilities which are separately metered or billed to each Unit by a utility company. Utilities which are not separately metered or billed shall be treated as Common Expenses. The Board shall have the authority to deem any delinquent unpaid sanitary sewer charge incurred in connection with the ownership of a Unit to be a Common Expense and to be paid by the Board and collected from the Unit Owner pursuant to Article 21. In the event that the Developer or the Board of Managers of the Association fails to pay any delinquent unpaid sanitary sewer charge then the Rock River Water Reclamation District (“District”) or its successor, following thirty days written notice to the Developer or registered agent of the Association, then the District shall be entitled, without further notice, to enter upon the Common Elements (as defined in the foregoing Declaration), and take such steps as it reasonably deems necessary to terminate sanitary sewer services to any such delinquent unit owner, including, without limitation, the excavating of land constituting the Common Elements. To the extent that any non-delinquent unit owner is harmed or affected thereby, Developer, on behalf of itself and its successors and assigns, hereby agree to indemnify and hold the District harmless from and against any and all claims, demands, liabilities or causes of action, including reasonable attorney’s fee it may suffer or incur by reason of the foregoing termination of sanitary sewer service. Developer does hereby guaranty the District the prompt payment of all liens and charges imposed by the District upon the property prior to the time that the management of the Association is turned over to the Unit Owners, within thirty (30) days after delivery of written notice to Developer by the District of the non-payment of the District’s charges by any Unit Owner. Such charges shall include, as appropriate, any late payment penalties due as of the date of notice. The Association does hereby guaranty the District the prompt payment of all liens and charges imposed by the District upon the property subsequent to the time that the management of the Association is turned over to the Unit Owners, within thirty (30) days after delivery of written notice to Association by the District of the non-payment of the District’s charges by any Unit Owner. Such charges shall include, as appropriate, any late payment penalties due as of the date of notice. (a)	The Board shall have the authority to and shall obtain insurance for the Property against loss or damage by fire, by flooding, against loss or damage by risks embraced by all risks coverage, and such other hazards as the Board may deem desirable, for the full insurable replacement cost, to be determined at least annually, of the Common Elements and the Units. Premiums for such insurance shall be Common Expenses. Such insurance coverage shall be written in the name of, losses under such policies shall be adjusted by, and the proceeds of such insurance shall be payable to, the Board as trustee for each of the Unit Owners in their respective percentages of ownership interest in the Common Elements as established in the Declaration. The Board may engage the services of any bank or trust company authorized to do trust business in Illinois to act as trustee, agent or depositary on behalf of the Board for the purpose of receiving and disbursing the insurance proceeds resulting from any loss, upon such terms as the Board shall determine consistent with the provisions of the Act and this Declaration. The fees of such corporate trustee shall be a Common Expense. In the event of any loss in excess of $50,000.00 in the aggregate, the Board shall engage a corporate trustee as aforesaid, or in the event of any loss resulting in the destruction of the major portion of one or more Units, the Board shall engage a corporate trustee as aforesaid upon the written demand of the mortgagee or owner of any Unit so destroyed. The proceeds of such insurance shall be applied by the Board or by the corporate trustee on behalf of the Board for the reconstruction of the Building, or shall be otherwise disposed of, in accordance with the provisions of this Declaration and the Act; and the rights of the mortgagee by any Unit under any standard mortgage clause endorsement to such polices shall, notwithstanding anything to the contrary therein contained, at all times be subject to the provisions in the Act with respect to the application of insurance proceeds to reconstruction of the Building. Payment by an insurance company to the Board or to such corporate trustee of the proceeds of any policy, and the receipt of release from the Board of the company’s liability under such policy, shall constitute a full discharge of such insurance company, and such company shall be under no obligation to inquire into the terms of any trust under which proceeds may be held pursuant hereto, or to take notice of any standard mortgage clause endorsement inconsistent with the provisions hereof, or to see the application of any payments of the proceeds of any policy by the Board or the corporate trustee. (b)	The Board shall also have the authority to and shall obtain broad form comprehensive public liability insurance against claims and liabilities arising in connection with the ownership, existence, use or management of the Property, including liabilities for injuries to and death of persons, personal injury and property damage, in such limits as it shall deem desirable; workmen’s compensation insurance; and other liability insurance as it may deem desirable, insuring each Unit Owner, the Association, its officers, members of the Board, the Declarant and its beneficiaries, the manager and managing agent of the Buildings, if any, and their respective employees and agents, from liability in connection with the Common Elements and the streets and sidewalks adjoining the Property, and insuring the officers of the Association and members of the Board from liability for good faith actions beyond the scope of their respective authorities. The Unit Owners shall be included as additional insureds with respect to that portion of the premises so reserved for their exclusive use. Such insurance coverage shall include cross claims for one or more insured parties against other insured parties. The insurance shall contain a waiver of any rights to subrogation by the insuring company against any of the above named insureds. The premiums for such insurance shall be Common Expenses. (c)	Each Unit Owner shall be responsible for his own insurance on the contents of his own Unit and furnishings and personal property therein, and his personal property stored elsewhere on the Property, and his personal liability to the extent not covered by the liability insurance for all of the Unit Owners obtained as part of the Common Expenses as provided above. The Board shall not be responsible for obtaining insurance on any additions, alterations or improvements made by any Unit Owner to his Unit unless and until such Unit Owner shall request the Board in writing so to do, and shall make arrangements satisfactory to the Board to reimburse the Board for any additional premiums attributable thereto; and upon the failure of such Unit Owner so to do, the Board shall not be obligated to apply any insurance proceeds to restore the affected Unit to a condition better than the condition existing prior to the making of such additions, alterations or improvements. (d)	Each Unit Owner hereby waives and releases any and all claims which he may have against any other Unit Owner, the Association, its officers, members of the Board, the Declarant and its beneficiaries, the manager and managing agent of the Building, if any, and their respective employees and agents, for damage to the Common Elements, the Units, or to any personal property located in the Units or Common Elements, caused by fire or other casualty, to the extent that such damage is covered by fire or other form of casualty insurance. ARTICLE 14. Maintenance, Repairs and Replacements. Each Unit Owner shall furnish and be responsible for, at his own expense, all of the maintenance, repairs and replacements within his own Unit and as to his Limited Common Elements, including but not limited to windows and doors, appliances, electrical fixtures, heating, plumbing and air-conditioning installations including condensers, lines, couplings, etc. which may be located outside the Unit boundaries, and that portion of any other utility outlet or service facility located within Unit boundaries, provided, however, that all snow removal from driveways and sidewalks, which may nevertheless be Limited Common Elements, shall be included as a Common Expense. The Association, by rules and regulations may provide for ordinary maintenance and minor repairs and replacement to be furnished to Units at Common Expense. The utility cost of exterior lighting shall be at the expense of the Unit Owner. Maintenance, repairs and replacements of the Common Elements shall be furnished by the Board as part of the Common Expenses, subject to the rules and regulations of the Board; provided, that at the discretion of the Board, it may direct Unit Owners of the Limited Common Elements in the name and for the account of such Unit Owners to arrange for such maintenance, repairs and replacements, to pay the cost thereof, and to procure and deliver to the Board such lien waivers and contractor’s and subcontractor’s sworn statements as may be required to protect the Property from all mechanics’ or materialmen’s lien claims that may arise therefrom. The Board may cause to be discharged any mechanics’ lien or other encumbrance which, in the opinion of the Board, may constitute a lien against the Property or Common Elements, rather than against a particular Unit and its corresponding percentage of ownership in the Common Elements. When less than all the Unit Owners are responsible for the existence of any such lien, the Unit Owners responsible shall be jointly and severally liable for the amount necessary to discharge the same and for all costs and expenses (including attorney’s fees) incurred by reason of such lien. Whenever the Board shall determine, in its discretion, that any maintenance or repair of any Unit is necessary to protect the Common Elements or any other portion of the Building, the Board may cause a written notice of the necessity for such maintenance and repair to be served upon such Unit Owner, which notice may be served by delivering a copy thereof to any occupant of such Unit, or by mailing the same by certified or registered mail addressed to the owner at the Unit. If such Unit Owner fails or refuses to perform any such maintenance or repair within a reasonable time stated in the notice (or any extension thereof approved by the Board), the Board may cause such maintenance and repair to be performed at the expense of such Unit Owner, and the Board shall levy a special assessment against such Unit Owner for the cost of such maintenance or repair. If, due to the act or neglect of a Unit Owner, or of a member of his family or household pet or of a guest or other authorized occupant or visitor of such Unit Owner, damage shall be caused to the Common Elements or to a Unit or Units owned by others, or maintenance, repairs and replacements, shall be required which would otherwise be at the Common Expense, then such Unit Owner shall pay for such damage and such maintenance, repairs and replacements, as may be determined by the Board, to the extent not covered by insurance. An authorized representative of the Association shall be entitled to reasonable access to each Unit as may be required in connection with inspection, maintenance, repairs, replacement or decoration of or to the Common Elements or any equipment, facilities or fixtures affecting or servicing other Units or the Common Elements. The Board shall have exclusive authority to take, or refrain from taking, any action pursuant to this Article 14. All expenses which, pursuant to this Article 14, are chargeable to any Unit Owner, may be specifically assessed to such Unit Owner and shall be payable by such Unit Owner as prescribed by the Board. ARTICLE 15. Alterations, Additions or Improvements. Except as constructed or altered by or with the permission of the Developer at any time prior to the election of the first Board, nothing shall be altered or constructed in or removed from the Common Elements, without the prior written consent of the Board. The Board may authorize and charge as Common Expenses (or in the case of Limited Common Elements shall charge to the Unit Owner benefited thereby) alterations and improvements of, and additions to, the Common Elements; provided, however, that in the event the costs thereof are to be charged as Common Expenses the Board shall not approve such alterations, improvements or additions requiring an expenditures in excess of $2,500.00 without the approval of Unit Owners owning not less than seventy-five percent (75%) in the aggregate in interest of the undivided ownership of the Common Elements. Any Unit Owner may make alterations, additions or improvements within his Unit without the prior written approval of the Board, but in any event such Unit Owner shall be responsible for any damage to other Units, the Common Elements, or the Property as a result of such alterations, additions or improvements. ARTICLE 16. Decorating. Each Unit Owner shall furnish and be responsible for, at his own expense, all of the decorating within his own Unit from time to time, including painting, wall papering, washing, cleaning, paneling, floor covering, draperies, window shades, curtains, lamps and other furnishings and interior decorating. Each Unit Owner shall be responsible for, at this own expense, decorating the Limited Common Elements in accordance with the rules and regulations of the Board. In the event the boundaries of any Unit, as shown on the Plat of Survey, are the finished undecorated interior surfaces of the perimeter walls, floor and ceilings thereof, the owner of such Unit shall be entitled to the exclusive use of such surfaces, and such Unit Owner shall maintain such surfaces in good condition at his sole expense as may be required from time to time, which said maintenance and use shall be subject to the rules and regulations of the Board, and each such Unit Owner shall have the right to decorate such surfaces from time to time in such manner as he may see fit and at his sole expense. The use of and the covering of the interior surfaces of windows, whether by draperies, shades or other items visible on the exterior of the Building, shall be subject to the rules and regulations of the Board. Decorating of the Common Elements (other than interior surfaces within the Units as above provided), and any redecorating of Units to the extend made necessary by any damage to existing decorating of such Units caused by maintenance, repair and replacement work on the Common Elements by the Board, shall be furnished by the Board as part of the Common Expenses. ARTICLE 17. Encroachments and Easements. (a)	In the event that by reason of the construction, reconstruction, settlement, or shifting of any Building, or the design or construction of any Unit, any part of the Common Elements encroaches or shall hereafter encroach upon any part of the Unit, or any part of the Unit encroaches or shall hereafter encroach upon any part of the Common Elements, or any portion of any Unit encroaches upon any part of any other Unit, valid easements for the maintenance of such encroachment are hereby established and shall exist for the benefit of such Unit or Common Elements so encroaching so long as all or any part of the building containing such Unit or Common Elements so encroaching shall remain standing; provided, however, that in no event shall a valid easement for any encroachments be created in favor of the Owner of any Unit or in favor of the Owners of the Common Elements if such encroachment occurred due to the intentional, negligent or willful conduct of said Owner or Owners or his agents. (b)	The Board may hereafter grant other and additional easements for the purposes of the benefit of the Property over, under, along and on any portion of the Common Elements and Limited Common Elements, and each Unit Owner hereby grants the Board an irrevocable power of attorney to execute, acknowledge, and record or register for and in the name of such Unit Owner, such instruments as may be necessary or appropriate to effectuate the foregoing. (c)	Easements are hereby declared and granted for utility purposes, including the right to install, lay, maintain, repair and replace water mains, pipes, sewer lines, gas mains, telephone wires and equipment, cables, transformers, and electrical conduits, wires and equipment, and cable television wires and equipment over, under, along and on any part of any Unit, the Common Elements and Limited Common Elements, as they exist on the date of the recording hereof or on the date of any amendment hereto. (d)	All easements and rights described herein are easements appurtenant, running with the land, and shall inure to the benefit of and be binding on the undersigned, its successors and assigns, and any owner, purchaser, mortgage and other person having an interest in said land, or any part or portion thereof. (f)	The Developer retains the right to enter upon and use the Common Elements and Limited Common Elements to advertise and to show prospective condominium purchasers the Property. ARTICLE 18. Use and Occupancy Restrictions. No Unit shall be used for other than residential purposes. Each Unit shall be used as a residence for a single family, and for no other purpose, by the Unit Owner and his family, or by a person or single family to whom the Unit Owner shall have leased his unit, subject to the provisions with respect to leasing contained in the Declaration. The Common Elements shall be used only for access, ingress and egress to and from the respective Units by the Respective families residing therein and their respective guests, household help and other authorized visitors, and for such other purposes which are incidental to the residential use of the respective Units; provided, however, the common parking areas, and other special areas shall be used for the purposes approved by the board. There shall be no obstruction of the Common Elements nor shall anything be stored in the Common Elements (except in areas designed for such purpose) without the prior consent of the Board or except as hereinafter, expressly provided. Each Unit Owner shall be obligated to maintain and keep in good order and repair his own Unit. Nothing shall be done or kept in any Unit or in the Common Elements serving the Units which will increase the rate of insurance on the Building or contents thereof without the prior written consent of the Board. No Unit Owner shall permit anything to be done or keep in his Unit or in the Common Elements which will result in the cancellation of insurance on the Building, or contents thereof, or which would be in violation of any law. No waste shall be committed in the Common Elements. No Noxious or offensive activity shall be carried on in any Unit or in the Common Elements, nor shall anything be done therein, either willfully or negligently, which may be or become an annoyance or nuisance to the other Unit Owners or Occupants. Nothing shall be done in any Unit or in, on or to the Common Elements which will impair the structural integrity of the Building or which would structurally change the Building except as is otherwise provided herein. No Unit Owner shall overload the electric wiring in the Building, or operate machines, appliances, accessories or equipment in such manner as to cause, in the judgment of the Board, an unreasonable disturbance to others. ARTICLE 19. Damage or Destruction and Restoration of Buildings. (a)	Sufficient Insurance: In the event the improvements forming a part of Property, or any portion thereof, including any Unit, shall suffer damage or destruction from any cause and the proceeds of any policy or policies insuring against such loss, or damage, and payable by reason thereof, shall be sufficient to pay the cost of repair or restoration or reconstruction, then such repair, restoration or reconstruction shall be undertaken and the insurance proceeds shall be applied by the Board or the payee of such insurance proceeds in payment therefor: provided, however, that in the event, within thirty (30) days after said damage or destruction shall occur, the Unit Owners elect either to sell the Property as provided in the Act and in Article 21 or to withdraw the Property from the provisions of this Declaration and from the provisions of the Act, as therein provided, then such repair, restoration or reconstruction shall not be undertaken. (b)	Insufficient Insurance. In the event the Property or the improvements thereon so damaged are not insured against the risk causing the loss or damage, or the insurance proceeds are not sufficient to pay the cost of repair, restoration or reconstruction, and the Unit Owners and all other parties in interest do not voluntarily make provisions for reconstruction of the improvements with one hundred eight days after said damage or destruction shall occur, then the provisions of Section 14 (1) of the Act shall apply. (c)	Substantial Restoration: Repair, restoration or reconstruction of the improvements, as used in this Article, means restoring the improvements to substantially the same condition in which they existed prior to the damage, which each Unit and the Common Elements having the same vertical and horizontal boundaries as before. ARTICLE 20. Sale of the Property. The Unit Owners, by affirmative vote of the Unit Owners owning not less than seventy-five percent in the aggregate in interest of the undivided ownership of the Common Elements, may elect to sell the Property as a whole. Such action shall be binding upon all Unit Owners, and it shall thereupon become the duty of every Unit Owner to execute and deliver such instruments and to perform all acts as in manner and form may be necessary to effect such sale, provided, however, that any Unit Owner who did not vote in favor of such action and who has filed written objection thereto with the Board within twenty days after the date of the meeting at which such sale was approved shall be entitled to receive from the proceeds of such sale an amount equivalent to the value of his interests, as determined by a fair appraisal, less the amount of any unpaid assessments or charges due and owing from such Unit Owner. In the absence of agreement on an appraiser, such Unit Owner and the Board may each select an appraiser, and the two so selected shall select a third, and the fair market value, as determined by a majority of the three so selected, shall control. If either party shall fail to select an appraiser, then the one designated by the other party shall make the appraisal. ARTICLE 21. Remedies. In the event of any default by any Unit Owner under the provisions of the Act, Declaration, By-laws or rules and regulation of the Board, the Board or its agents shall have each and all of the rights and remedies which may be provided for in the Act, Declaration, By-laws or said rules and regulations or which may be available at law or in equity, and may prosecute any action or other proceeding against such defaulting Unit Owner or others for enforcement of any lien and the appointment of a receiver for the Unit and ownership interest of such Unit Owner, or for damages or injunction or specific performance, or for judgment for payment of money and collection thereof, or the right to take possession of the Unit and to sell the same as provided in this article, or for any combination of remedies, or for any other relief. All expense of the Board in connection with any such actions or proceedings, including court costs and attorney’s fees and other fees and expenses and all damages, liquidated or otherwise, together with interest thereon at the rate of nine percent per annum until paid, shall be charged to and assessed against such defaulting Unit Owner, and shall be added to and deemed part of his respective share of the Common Expenses. The Board shall have a lien for all of the same, as well as for non-payment of his respective share of the Common Expenses, upon the Unit and ownership interest in the Common Elements and Limited Common Elements of such defaulting unit Owner and upon all of his additions and improvements thereto and upon all of his personal property in his Unit or located elsewhere on the Property. In the event of any such default by any Unit Owner, the Board and the manager or managing agent, if so authorized by the Board, shall have the authority to correct such default, and to do whatever may be necessary for such purpose, and all expenses in connection therewith shall be charge to and assessed against such defaulting Unit Owner. Any and all such rights and remedies may be exercised at any time and from time to time, cumulatively or otherwise, by the Board. The violation of any restriction or condition or regulation adopted by the Board or the breach of any covenant or provision herein contained shall give the Board the right, in addition to any other rights provided for in this Declaration: (a) to enter upon the Unit, or any portion of the Property upon which, or as to which, such violation or breach exists and to summarily abate and remove, at the expense of the defaulting Unit Owner, any structure, thing or condition that may exist thereon contrary to the intent and meaning of the provisions hereof, and the Board, or its employees or agents, shall not thereby be deemed guilty in any manner of trespass; or (b) to enjoin, abate or remedy by appropriate legal proceedings, either at law or in equity, the continuance of any breach; or (c) to take possession of such Unit Owner’s interest in the Property and to maintain an action for possession of such Unit in the manner provided by law. If any Unit Owner (either by his own conduct or by the conduct of any other occupant of his Unit) shall violate any of the covenants or restriction or provisions of this Declaration or the regulations adopted by the Board, and such violation shall not be cured within thirty days after notice in writing from the Board, or shall re-occur more than once thereafter, then the Board shall have the power to issue to said defaulting Owner to 10-day notice in writing to terminate the rights of the said defaulting Owner to continue as a Unit Owner and to continue to occupy, use or control his Unit, and thereupon an action in equity may be filed by the Board against said defaulting Owner for a decree of mandatory injunction against said defaulting Owner or occupant (subject to the prior consent in writing of any mortgagee having a security interest in the Unit Ownership of said defaulting Owner, which consent shall not be unreasonably withheld), or in the alternative, for a decree declaring the termination of said defaulting Owner’s right to occupy, use or control the Unit owned by him on account of said violation, and ordering that all the right, title and interest of said defaulting Owner in the Property shall be sold (subject to the lien of any existing mortgage) at a judicial sale upon such notice and terms as the court shall determine, except that the court shall enjoin and restrain the said defaulting Owner from reacquiring his interest at judicial sale. The proceeds of any such judicial sale shall first be paid to discharge courts costs, court reporter charges, reasonable attorneys’ fees and all other expenses of the proceeding and sale, and all such items shall be taxes against said defaulting Owner in said decree. Any balance of proceeds, after satisfaction of such charges and any unpaid assessments hereunder of any liens, shall be paid to said defaulting Owner. Upon the confirmation of such sale, the purchaser shall thereupon be entitled to a deed to the Unit and the Unit Owner’s corresponding percentage of ownership in the Common Elements, and to immediate possession of the Unit sold and may apply to the court for a writ of assistance for the purpose of acquiring such possession. It shall be a condition of any such sale, and the decree shall so provide, that the purchases shall take the interest in the Unit Ownership sold subject to this Declaration. ARTICLE 22. Annexing Additional Property. (a)	The Declarant and Developer reserve the right, pursuant to §25 of the Act, within ten (10) years from the date of the recording of this declaration, to annex and add to the Parcel and Property and construct 60 additional Units to the Condominium Project as submitted and as created by this Declaration, all or any portion of the real estate described on Exhibit E (the “additional land”) hereto by recording an amended plat in accordance with §5 of the Act and an Amended Declaration in accordance with §6 of the Act. No rights of any character whatever within the additional land attach to any owner except as to that portion described on Exhibit A and except as to that portion described in any recorded Amended Declaration annexing and adding such portion to this Declaration as part of the condominium created by this Declaration. (b)	The additional land or any portion thereof may be annexed in any order, at any time or times within such ten year period, without limitation, and be as deemed appropriate by the Developer in its sole discretion. The boundaries of such additional land are those of the parcels described on Exhibit E. None of such additional land is required to be annexed. There is no limitation on the location of improvements on the additional land. The maximum number of units per acre to be placed on the additional land shall be four or such number as allowed by applicable zoning ordinance, whichever is greater. The Developer shall have a permanent easement of ingress and egress over the existing common elements for the purpose of construction or making additions or improvements to the additional land. (c)	The maximum number of units which may be constructed on the additional land annexed to the property is sixty-two (62). Two units maximum may be added to each subdivision lot of the additional property. (d)	The structures, improvements, buildings and units which are constructed on the additional land will be compatible, in the sole opinion of the Developer, to the configuration of the property in relation to the use, density, construction and architectural style of the property, and shall be upon the additional land in conformance with all zoning ordinances. (e)	Each Amended Declaration shall include an amended Exhibit A (legal description of portions of additional land already subjected to the provisions of the Act) which shall amend Exhibit A hereto by setting forth the amended legal description of the Parcel to include the additional parcel or parcels annexed hereto, as well as a separate legal description of such addition. The Amended Declaration shall also contain an amended Plat showing the boundaries of such addition and of the entire Parcel as amended, and delineating the additional Units added by such additions, all in accordance with §5 of the Act. Each Amended Declaration shall also include an Amended Exhibit C which shall amend Exhibit B hereto by setting forth the amended percentages of the undivided interests in the Common Elements (as amended and added to by such Amended Declaration) allocated to each Unit (including all previous Units and the additional Units added by such Amended Declaration). (f)	The percentages of undivided ownership interest in the Common Elements as amended by each Amended Declaration and as set forth in the amended Exhibit C shall be determined and adjusted in the following manner. ii. the Common Elements added by such Amended Declaration (hereinafter referred to as the “Added Common Elements”). iv. the Units added by such Amended Declaration (hereinafter referred to as the “Added Units”). The value of each of the Added Units shall be added to the aggregate value of the Existing Units and the total thereof shall be deemed to be the new value of the Property as a whole. “Value” as used in this paragraph shall be determined by the Developer as of the date of recording of the Amended Declaration. Such determination by the Developer shall be conclusive and binding upon all unit owners, mortgagees and other parties who then or in the future have any interest in the Property. The percentages of undivided ownership interest, as amended and adjusted by such Amended Declaration, in the entire Common Elements, consisting of the Existing Common Elements plus the Added Common Elements, to be allocated among all the Units, consisting of the Existing Units plus the Added Units, shall be computed by taking as a basis the value of each Unit in relation to the value of the Property as a whole, determined as aforesaid. The existing Units shall be entitled to their respective percentages of ownership, as amended and adjusted and set forth in amended Exhibit C attached to such Amended Declaration, in the Added Common Elements as well as in the Existing Common Elements. The Added Units shall be entitled to their respective percentages of ownership, as set forth in such amended Exhibit C, not only in the Added Common Elements but also in the Existing Common Elements, as set out in Article 8 of the original declaration. Each and all of the provisions of this Declaration and the Exhibits attached hereto, as amended by each such successive Amended Declaration and the amended Exhibits attached thereto, shall be deemed to apply to each and all of the Units, including all such Added Units as well as all existing Units, and to all of the Common Elements, including all such Added Common Elements as well as all Existing Common Elements. The recording of an Amended Declaration shall not alter or affect the amounts of any liens for common expenses due from any Existing Unit Owners prior to such recording, nor the respective amounts theretofore assessed to or due from Existing Unit Owners for common expenses or other assessments. (g)	The lien of any mortgage encumbering any Existing Unit, together with its appurtenant percentage of undivided ownership interest in the Existing Common Elements, shall automatically be deemed to be adjusted and amended when an Amended Declaration is recorded, in accordance with the respective percentage of undivided ownership interest in the Common Elements for such Existing Unit as set forth in the amended Exhibit C attached to such Amended Declaration, and the lien of such mortgage shall automatically attach in such percentage to the Added Common Elements. (h)	Each and all of the Unit Owners, of all Existing Units and of all Added Units hereafter, and their respective mortgagees, grantees, heirs, administrators, executors, legal representatives, successors and assigns, by their acceptance of any deed or mortgage or other interest in or with respect to any of such Units, shall be deemed to have expressly agreed, assented and consented to each and all of the provisions of this Declaration, with respect to the recording of any and all Amended Declarations as aforesaid which may amend, adjust and reallocate from time to time their respective percentages of undivided ownership interest in the Common Elements including the Existing Common Elements and Added Common Elements, from time to time as hereinabove provided; and hereby further agree to each and all of the provisions of each and all of said Amended Declarations which may hereafter be recorded in accordance with the foregoing provisions of this Declaration. i. The Portion of the additional land described in each such Amended Declaration shall be governed in all respects by the provisions of this Declaration. ii. The percentage of ownership in the Common Elements appurtenant to each Unit shall automatically be shifted and reallocated to the extent set forth in each such recorded Amended Declaration and upon the recording of each such Amended Declaration, the amount by which such percentage appurtenant to a Unit is reduced, as set forth in each such recorded Amended Declaration, shall thereby be and deemed to be released and divested from such Unit Owner and reconveyed and reallocated among the other Unit Owners and set forth in each such recorded Amended Declaration. iii. Each deed, mortgage or other instrument affecting a Unit shall be deemed give subject to the conditional limitation that the percentage of ownership in the Common Elements appurtenant to each Unit shall, upon the recording of each Amended Declaration, be divested pro tanto to the reduced percentage set forth in such Amended Declaration and vested among the other Owners, mortgagees and others owning an interest in the other Units in accordance with the terms and percentages of each such recorded Amended Declaration. iv. A right of revocation is hereby reserved by the grantor in each such deed, mortgage or other instrument of a Unit to so amend and reallocate the percentages of ownership in the Common Elements appurtenant to each Unit. automatically include and attach to such additional Common Elements as such Amended Declarations are recorded. vi. Each Owner shall have a perpetual easement, appurtenant to his Unit, for the use of any additional Common Elements annexed thereto by and described in any recorded Amended Declaration, for the purposes therein set forth, except as to any portion the use of which is limited by exclusive easements granted to the Owners of specific Units as may be provided in any such Amended Declaration, or this Declaration and except as to any portion which may be designated as Limited Common Elements. vii. Each Owner by acceptance of the deed conveying his Unit, agrees for himself and all those claiming under him, including mortgagees, that this Declaration and each Amended Declaration is and shall be deemed to be in accordance with the Act and for purposes of this Declaration and the Act, any changes in the respective percentages of ownership in the Common Elements as set forth in each such Amended Declaration shall be deemed to be made by agreement of all Unit Owners. viii. The Trustee and Developer reserve the right to amend this Declaration in such manner, and each Owner agrees to execute and deliver such documents necessary or desirable to cause the provisions of this Declaration to comply with the Act as it may be amended from time to time. ix. The foregoing provisions of this Declaration and in deeds and mortgages of the Units and Common Elements contain and will contain clauses designed to accomplish a shifting of the Common Elements. None of said provisions shall invalidate the other, but each shall be deemed supplementary to the other toward the end that a valid shifting of the Common Elements can be accomplished. ARTICLE 23. Amendment. The provision of this Declaration may be changed, modified or rescinded by an instrument in writing setting forth such change, modification or rescission by affirmative vote of the Unit Owners owning not less than seventy-five percent in the aggregate in interest of the undivided ownership of the Common Elements, which instrument shall be signed by the president and certified by the secretary of the Board; provided, however, that all lien holders of record have been notified by certified mail of such change, modification or rescission and an affidavit by said secretary certifying to such mailing is a part of such instrument. Notwithstanding the provisions of the foregoing paragraph, if the Act, or this Declaration, or the By-laws, requires the consent or agreement of all Unit Owners or of all lien holders for any action specified in the Act or in this Declaration, then any instrument changing, modifying or rescinding any provision of this Declaration with respect to such action shall be signed by all the Unit Owners or all lien holders or both as required by the Act or this Declaration. The change, modification or rescission, whether accomplished under either of the provisions of the preceding two paragraphs, shall be effective upon recordation of such instrument of the Recorder of Deeds of Winnebago County; provided, however, that no provisions in this Declaration may be changed, modified or rescinded so as to conflict with the provisions of the Act. No change, modification or amendment which affects the rights, privileges or obligations of the Declarant or the Developer shall be effective without the prior written consent of the Declarant or Developer. ARTICLE 24. Notices. Notices provided for in the Act, Declaration or By-laws shall be in writing, and shall be addressed to the Board c/o Ron Swenson Construction, Inc., 5811 E. Riverside Blvd., Rockford, Illinois, 61114 or to any Unit Owner, as the case may be, at the number of the respective Unit if addressed to a Unit Owner, or at such other address as hereinafter provided. The Board may designate a different address for notices to it by giving written notice of such change of address to all Unit Owners at such time. Any Unit Owner may also designate a different address or addresses for notice to him by giving written notice of his change of address to the Board. Notices addressed as above shall be deemed delivered when mailed by United States registered or certified mail or when delivered in person with written acknowledgment of the receipt thereof. ARTICLE 25. Severability. If any provision of this Declaration or By-laws or any section, sentence, clause, phrase or word, or the application thereof in any circumstances, is held invalid, the validity of the remainder of the Declaration and By-laws and of the application of any such provision, section, sentence, clause, phrase or word in any other circumstances shall not be affected thereby. ARTICLE 26. Perpetuities and Other Rules of Property. If any of the options, privileges, covenants or rights created by this Declaration would otherwise violate (a) the rule against perpetuities or some analogous statutory provision, or (b) any other statutory or common law rules imposing time limits, then such provision shall continue only until twenty-one (21) years after the death of the survivor of the now living lawful descendants of the incumbent Governor of the State of Illinois and the incumbent President of the United States. ARTICLE 27. Rights and Obligations. Each grantee of Declarant by the acceptance of a deed of conveyance, and each purchaser under any contract of such deed of conveyance, accepts the same subject to all easements, restrictions, conditions, covenants, reservations, liens and charges, and the jurisdiction, rights and powers created or reserved by this Declaration, and all rights, benefits and privileges of every character hereby granted, created, reserved or declared, and all impositions and obligations hereby imposed shall be deemed to taken to be covenants running with the land, and shall bind any Person having at any time any interest or estate in said land, and shall inure to the benefit of such Person in like manner as though the provisions of this Declaration were recited and stipulated at length in each and every deed of conveyance, or in any mortgage or trust deed or other evidence of obligation, to the rights described in this Article or described in any other part of this Declaration or the By-laws shall be necessary to create and reserve such easements and rights to the respective grantees, mortgagees, and trustees of such Unit Ownerships. (a)	Until such time as the Board provided for in this Declaration is formed, the Developer shall exercise any of the powers, rights, duties and functions of the Board. (b)	No covenants, restrictions, conditions, obligations, or provisions contained in this Declaration shall be deemed to have been abrogated or waived by reason of any failure to enforce the same, irrespective of the number of violations or breaches which may occur. (c)	The provisions of this Declaration shall be liberally construed to effectuate its purpose of creating a uniform plan for the operation of a first class condominium. (d)	In the event title to any Unit Ownership is conveyed to a title holding trust, under the terms of which all powers of management, operation and control of the Unit Ownership remain vested in the trust beneficiary or beneficiaries, then the beneficiaries thereunder from time to time shall be responsible for payment of all obligations, liens, or indebtedness and for the performance of all agreements, covenants, and undertakings chargeable or created under this Declaration against such Unit Ownership. No claim shall be made against any such titleholding trustee personally for payment of any lien or obligation hereunder created. The amount of such lien or obligation shall continue to be a charge of lien upon the Unit Ownership and the beneficiaries of such trust notwithstanding any transfers of the beneficial interest of any trust of any transfers of title to such Unit Ownership. ARTICLE 29. Mortgagee’s Rights. The Board shall, at the request of any First Mortgagee, give such First Mortgagee notice of any default by the Unit Owner whose Unit is encumbered by the mortgage or trust deed owned or held by such First Mortgagee in the performance of such Unit Owner’s duties hereunder which are not cured within thirty days after the date the Unit Owner is notified by the Board to cure such default or a copy of all notices permitted or required by this Declaration to be given to the Unit Owner or Owners Unit is subject to such mortgage or trust deed. The Board shall allow any First Mortgagee to examine the books and records of the Board during reasonable business hours and to receive, on request, annual reports and other financial data prepared by the Board or at its direction. ARTICLE 30. Trustee Exculpation. It is expressly understood and agreed by and between the parties hereto, anything herein to the contrary notwithstanding, that each and all of the warranties, indemnities, representations, covenants, undertakings and agreements of said Trustee herein made on the part of the Trustee while in form purporting to be the warranties, indemnities, representations, covenants, undertakings and agreements of said Trustee are nevertheless each and every one of them, made and intended not as personal warranties, indemnities, representations, covenants, undertakings and agreements by the Trustee or for the purpose or with the intention of binding said Trustee personally but are made and intended for the purpose of binding only that portion of the trust property specifically described herein, and this instrument is executed and delivered by said Trustee not in its own right, but solely in the exercise of the powers conferred upon it as such Trustee and that no personal liability or personal responsibility is assumed by not shall at any time be asserted or enforceable against the Trustee, on account of this instrument or on account of any warranty, indemnity, representation, covenant, undertaking or agreement of the said Trustee in this instrument contained, either expressed or implied, all such personal liability, if any, being expressly waived and released. IN WITNESS WHEREOF, Today’s Bank-East, as trustee of its Trust No. 85-1098 has caused its name to be signed to this document and attested thereto this 28th day of November, 1995. DO HEREBY CERTIFY THAT Mary R. Horn personally known to me to be the Client Services Officer of Today’s Bank-East, and Patrick W. Morrow , personally known to me to be the Assistant Trust Officer of said national banking association, whose names are subscribed to the foregoing instrument, appeared before me this day in person and acknowledged that they signed, sealed and delivered the said instrument as their free and voluntary act as such Vice President and Trust Officer, respectively, and as the free and voluntary act of said Today’s Bank-East. Given under my hand and Notarial Seal this 28th day of November, 1995. Today’s Bank-East, as trustee of its Trust No. 85-1098, Rockford, Illinois, being the Developer of The Condominiums of Springbrook, (herein “Developer”), being the record title holder of the Property, as defined in the Declaration of Condominium Ownership for The Condominiums of Springbrook, (herein “Declaration”), hereby certifies that prior to the execution of any agreement of sale for a Condominium Unit in The Condominiums of Springbrook, there were no tenants of such units as they were newly constructed. Consequently, the Developer was not required to give a notice of intent to submit the Parcel and Property, as these terms are defined and used in the declaration, to the Illinois Condominium Property Act, as is required by the Act, to any persons as there were no tenants of the Property on the date the notice of intent was given. DO HEREBY CERTIFY THAT Mary R. Horn personally known to me to be the Client Services Officer of Today’s Bank-East, and Patrick W. Morrow, personally known to me to be the Assistant Trust Officer of said national banking association, whose names are subscribed to the foregoing instrument, appeared before me this day in person and acknowledged that they signed, sealed and delivered the said instrument as their free and voluntary act as such Vice President and Trust Officer, respectively, and as the free and voluntary act of said Today’s Bank-East. Section 1. 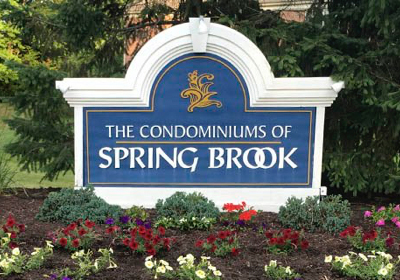 There shall be one class of membership of The Condominiums of Springbrook Homeowners’ Association and the members shall consist of the Unit Owners of the Property known as The Condominiums of Springbrook as described in the Declaration of Condominium Ownership for The Condominiums of Springbrook. Section 2. There shall be one person with respect to each Unit Ownership who shall be entitled to vote at any meeting of the Unit Owners. Such person shall be known (and hereinafter referred to) as a “voting member”. Such voting member may be the Unit Owner or one of the group composed of all of the Unit Owners of a Unit Ownership, or may be some person, designated by such Unit Owner or Unit Owners to act as proxy on his or their behalf and who must be a Unit Owner. No person may act as a proxy for more than 5 votes. Such designation shall be made in writing to the Board and shall be revocable at any time by actual notice to the Board of the death or judicially declared incompetence of any designator, or by written notice to the Board by the unit Owner or Unit Owners. Any or all of such Unit Owners may be present at any meeting of the voting members and (those constituting a group acting as a single voting member) may vote or take any other action as a voting member either in person or by proxy. However, a voting member or his proxy shall not be entitled to vote or considered for purposes of a quorum if he is delinquent in his assessment. The total number of votes of all voting members shall be 100, and each Owner or group of Owners shall be entitled to the number of votes equal to the total of the percentage of ownership in the Common Elements applicable to his or their Unit Ownership as set forth in Exhibit “C”. Declarant shall be the voting member with respect to any Unit Ownership owned by the Declarant. When thirty percent or fewer of the Units, by number possesses over fifty percent in aggregate of the votes in the Association, any percentage vote of members specified herein or in the Declaration shall require the specified percentage by number of Units rather than by percentage of interest in the Common Elements allocated to Units, which would otherwise apply. Section 3. Meetings of the voting members shall be held at the Property or at such other place in Winnebago County as may be designated in any notice of a meeting. The presence in person or by proxy at any meeting of the voting members having a majority of the total votes shall constitute a quorum, except as noted in section 2 above. Unless otherwise expressly provided herein or in the Declaration or Condominium Property Act, any action may be taken at any meeting of the voting members at which a quorum is present upon the affirmative vote of more than 50% of the members represented at such meeting, except that the affirmative vote of not less than 66 2/3% of the votes of voting members at a meeting shall be necessary to approve a merger or consolidation of the Association, a sale, lease, exchange, mortgage, pledge or other disposition of all or substantially all of the property and assets of the Association, and the purchase or sale of land or of Units on behalf of all Unit Owners. Section 3(a). The members shall hold an annual meeting and the first annual meeting of the Unit Owners shall be called by the Developer, upon 14 days’ written notice to each Unit Owner. Such meeting shall take place on the first business day which is 60 days from the date when 75% of the units have been conveyed by the Developer, or such earlier time as selected by the Developer. Thereafter, there shall be an annual meeting of the voting members on the first Monday of August following such initial meeting, and on the first Monday of August of each succeeding year thereafter, at 7:30 p.m., or at such other reasonable time or date (not more than 30 days before or after such date) as may be designated by written notice of the Board delivered to the voting members not less than 14 days nor more than 30 days prior to the date fixed for said meeting. Section 3(b). Special meetings of the voting members may be called at any time for the purpose of considering matters which, by the terms of the Declaration, required the approval of all or some of the voting members, or for any other reasonable purpose. Said meetings shall be called by written notice, authorized by a majority of the Board or by the President, or by the voting members having 20% of the total votes, and delivered not less than 10 days nor more than 30 days prior to the date fixed for said meeting. The notices shall specify the date, time and place of the meeting and the matters to be considered. Section 3(c). Notices of meetings required to be given herein may be delivered either personally or by mail to the persons entitled to vote at such meetings, addressed to each such person at the address given by him to the Board for the purpose of service of such notice, or to the Unit of the Owner with respect to which such voting right appertains, if no address has been given to the Board. Section 3(d). Each Unit Owner shall receive notice, in the same manner as provided for membership meetings, of any meeting of the Board of Managers concerning the adoption of the proposed annual budget, or any increase, or establishment of any assessment. Section 3(e). If an adopted budget requires assessment against the Unit Owners in any fiscal or calendar year exceeding 115% of the assessments for the preceding year, the Board of Managers, upon the filing of a written petition by Unit Owners with not less than 20% of the total votes within fourteen (14) days of the Board action, shall call a meeting of the Unit Owners within thirty (30) days of the date of filing of the petition to consider the budget. Unless a majority of the votes of the Unit Owners are cast at the meeting to reject the budget, the budget shall be ratified, whether or not a quorum is present. In determining whether assessments exceed 115% of similar assessments in prior years, any authorized provisions for reasonable reserves, and anticipated expenses by the Association which are not anticipated to be incurred on a regular or annual basis shall be excluded from the computation. Section 3(f). In the event of a resale of a unit, the purchaser of such unit from a Seller other than the Developer pursuant to an installment contract for purchase as defined by the Act shall, during such time as he or she resides in the unit (i) be counted toward a quorum for purposes of the election of the Board at any meeting of the Unit Owners called for purposes of electing members of the Board; (ii) have the right to vote for the election of members of the Board; and (iii) have the right to be elected to and serve on the Board, unless the Seller of said Unit retains in writing any or all such rights. In no event shall the Seller and the Purchaser both be counted toward a quorum, be permitted to vote for a particular office or be elected and serve on the Board. Satisfactory evidence of the installment contract shall be made to the Association or the Board by the Seller within ten (10) days of its execution. Section 1. The affairs of the corporation shall be managed by its Board of Directors. Section 2. Until the date of the first annual meeting of the members as hereinabove provided, the number of directors shall be three, who shall be the directors named in the articles of incorporation. Commencing with the date of the first annual meeting of the members, the number of directors shall be three and each director shall hold office until the next annual meeting of members and until his successor shall have been elected and qualified. Except for the directors named in the articles of incorporation, only a member of the corporation may be a director of that corporation. In the event that a member is a corporation, partnership, trust, or other legal entity other than a natural person or persons, then any shareholder, officer or director of such corporation, partner of such partnership, beneficiary or individual trustee of such trust, or manager of such other legal entity, may be eligible to serve as a director. A majority of the total number of members on the Board shall constitute a quorum. The voting members having at least 2/3 of the total votes may from time to time increase or decrease such number of persons on the Board or may increase the term of office of Board members at any annual or special meeting, provided that such number shall not be less than 3, and that the terms of at least 1/3 of the persons on the Board shall expire annually. Members of the Board of Directors shall be elected by a plurality of the voting members present at the annual meeting. If at any time the number of voting members is less than 3, the Board shall consist of all existing voting members, notwithstanding any provisions in this section to the contrary. No member of the Board or officer shall be elected for a term of more than two years, but officers and members of the Board may succeed themselves. A candidate for election to the Board, or his representative, shall have the right to be present at the counting of the ballots. Members of the Board shall receive no compensation for their services, unless expressly allowed by the Board at the direction of the voting members having 2/3 of the total vote. Vacancies on the Board, including vacancies due to any increases in the number of persons on the Board, shall be filled by appointment by the Board until an election by the voting members present at the next annual meeting or at a special meeting of the voting members called for such purpose. A meeting of the Unit Owners for the purposes of filling a vacancy on the Board shall be called no later than 30 days after filling of a written petition by either of the Unit Owners requesting such a meeting. Except as otherwise provided in the By-laws, the Property shall be managed by the Board and the Board shall act by majority vote of those present at its meetings when a quorum exists. Meetings of the Board may be called, held and conducted in accordance with such regulations as the Board may adopt, provided that all meetings of the Board shall be open to all Unit Owners and their proxies, except as otherwise stated herein, and that the Board shall meet at least once each quarter of the fiscal year. Section 3. A regular annual meeting of the Board of Directors shall be held without other notice than this By-law, immediately after, and at the same place as, the annual meeting of members. The Board of Directors may provide by regulations which the Board of Directors may, from time to time, adopt, the time and place fore the holding of additional regular meetings of the Board without other notice than such regulation. Inclusive of the annual meeting, the Board shall meet at least four (4) times annually. Section 4. Special meetings of the Board of Directors may be called by or at the request of the president or any two directors. The person or persons authorized to call special meetings of the Board may fix any place as the place for holding any special meeting of the Board called by them. Section 5. Each year the Board shall elect from its members a President who shall preside over both its meetings and those of the voting members, and who shall be the chief executive officer of the Board; a Secretary who shall keep the minutes of all meetings of the Board and of the voting members, who shall give and receive notices on behalf of the Board, who shall execute amendments to the condominium instrument, who shall, in general, perform all the duties incident to the office of Secretary; and a Treasurer who shall keep the financial records and books of account; and such additional officers as the Board shall see fit to elect. Each officer shall have the general powers usually vested in such officer of a not-for-profit corporation; shall serve until his successor shall have been elected and qualified; and shall receive no compensation for his services unless expressly provided for in a unanimous resolution duly adopted by the voting members. Section 6. Any Board member may be removed from office at any annual or special meeting called for that purpose by affirmative vote of the voting members having 2/3 of the total votes. A successor to fill the unexpired term of the Board member may be elected by the voting members at the same meeting or any subsequent meeting called for that purpose. Section 7. The meetings of the Board shall be open to any Unit Owner except for the portion of any meeting held to (i) discuss litigation when an action against or on behalf of the Association has been filed and is pending in a court or administrative tribunal, or when the Board finds that such an action is probable or imminent; (ii) consider information regarding appointment, employment or dismissal of an employee; or (iii) discuss violations of rules and regulations of the Association or a Unit Owner’s unpaid share of common expenses. Any vote on these matters shall be taken at a meeting or portion thereof which is open to any Unit Owner. Any Unit Owner may record the proceedings at meetings or portions thereof which are required to be open by these By-laws and the Act, by tape, film or other means, subject to the right of the Board to prescribe reasonable rules and regulations to govern the right to make such recordings. Notice of such meetings shall be mailed and delivered at least forty- eight (48) hours prior to the scheduled meeting time, unless a written waiver of such notice is signed by the person or persons entitled to such notice pursuant to these By-laws or the Act. Copies of notices of meetings of the Board shall be posted at least forty-eight (48) hours prior to the meeting in a location or locations to be designated by the Board at the first annual meeting. Section 8. All agreements, contracts, deeds, leases, vouchers for payment of expenditures and other instruments shall be signed by such officer or agent of the Board and in such manner as from time to time shall be determined by written resolution of the board. In the absence of such determination by the Board, such documents shall be signed by the President and countersigned by the Secretary of the Board. i. Water, waste removal, electricity and other necessary utility services for the Common Elements and (if not separately metered or charged) for the Units. ii. The service of a manager or managing agent or any other person or firm employed by the Board. iii. Payment for the maintenance, repair and replacement of the Common Elements. (i)	to bid for and purchase any Unit Ownership at a sale pursuant to a mortgage foreclosure, or a foreclosure of the lien for Common Expenses under the Act, or at a sale pursuant to an order or direction of a court, or other involuntary sale, upon the consent or approval of Unit Owners owning not less than 66 2/3% in the aggregate in interest of the undivided ownership of the Common Elements. (l)	to delegate any specific power of an officer to any other officer or impose such limitations or restrictions upon the powers of any officer. Section 10. The Board shall not approve any capital expenditure in excess of $10,000.00 nor enter into any contracts having a term of more than two years without the unanimous approval of Unit Owners. Section 1. Each calendar year the Board shall prepare a proposed annual budget, and shall estimate the total amount necessary to pay the cost of wages, materials, insurance, services and supplies which will be required during the ensuing calendar year for the rendering of all services, together with a reasonable amount considered by the Board to be necessary for a reserve for contingencies and replacements. first of each and every month following the adoption and effective date of the budget each Unit Owner shall be obligated to pay to the Board or as it may direct, 1/12 of the assessment made pursuant to this paragraph. At least 30 days prior to the meeting of the Board at which it proposes to adopt said budget, the Board shall also supply to all Unit Owners an itemized accounting of the maintenance expenses for the preceding calendar year actually incurred and paid, together with a tabulation of the amounts collected pursuant to the estimates provided, and showing the net amount over or short of the actual expenditures plus reserves. Any amount accumulated in excess of the amount required for actual expenses and reserves shall be credited toward the budget for the next year, and any net shortage shall be charged in a lump sum to each Unit Owner according to his percentage of ownership in the Common Elements. Section 2. The Board shall build up and maintain a reasonable reserve for contingencies and replacements. Extraordinary expenditures not originally included in the annual estimate which may become necessary during the year shall be charged first against such reserve. If said “estimated case requirement” proves inadequate for any reason, including non-payment of any Unit Owner’s assessment, the Board may at any time levy a further assessment, which shall be assessed to the Unit Owners according to each Unit Owner’s percentage ownership in the Common Elements. The Board shall serve notice of such further assessments on all Unit Owners by a statement in writing giving the amount and reasons therefor, and such further assessment shall become effective with the next monthly maintenance payment which is due more than 10 days after the delivery or mailing of such notice of further assessment. All Unit Owners shall be obligated to pay the adjusted monthly amount. Section 3. When the first Board elected hereunder takes office, it shall determine the “estimated cash requirement,” as hereinabove defined, for the period commencing 30 days after said election and ending on December 31 of the calendar year in which said election occurs. Assessments shall be levied against the Unit Owners during said period as provided in Section 1 of this Article. Section 4. The failure or delay of the Board to prepare or serve the annual or adjusted estimate on the Unit Owner shall not constitute a waiver or release in any manner of such Unit Owner’s obligation to pay the maintenance costs and necessary reserves, as herein provided, whenever they shall be determined, and in the absence of any annual estimate or adjusted estimate, the Unit Owner shall continue to pay the monthly maintenance charge at the then existing monthly rate established for the previous period until the next monthly maintenance payment which is due more than 10 days after such new annual or adjusted estimate shall have been mailed or delivered. Section 5. The Board shall keep full and correct books of account in chronological order of the receipts and expenditures affecting the Common Elements, specifying and itemizing the maintenance and repair expenses of the Common Elements and any other expenses incurred, which books of account shall be audited at least annually by a certified public accountant. The Board shall keep a separate account for each Unit Owner showing his assessment and payments. Such records and vouchers authorizing the payments shall be available for inspection by any Unit Owner or any representative of a Unit Owner duly authorized in writing, at such reasonable time or times during normal business hours as may be requested by the Unit Owner. Upon 10 days’ notice to the Board and payment of a reasonable fee, any Unit Owner shall be furnished a statement of his account setting forth the amount of any unpaid assessments or other charges due and owing from such owner. Section 6. If a Unit Owner is in default in the monthly payment of the aforesaid charges or assessments for 30 days, the members of the Board may bring suit on behalf of themselves and all Unit Owners to enforce collection thereof, to enforce the possession remedy provided by law and by the Declaration, or to foreclose the lien therefor. There shall be added to the amount due the costs of suit, and other fees and expenses together with interest and attorneys’ fees. To the extent permitted by law, the amount of any delinquent and unpaid charges or assessments and interest, costs and fees as above provided shall be a lien or charge against the Unit Ownership of the Unit Owner involved, when payable, and may be foreclosed by an action brought in the name of the Board as in the case of foreclosure of liens against real estate. Said lien shall take effect and be in force as provided in the Condominium Property Act of Illinois. Section 7. No Unit Owner may waive or otherwise escape liability for the assessments provided for herein by non-use of the Common Elements or abandonment of his Unit. Section 8. Until the first meeting of the Unit Owners is held and the amount of the monthly assessments to be paid by the Unit Owners is determined by the Board, each Unit Owner (including the Developer with respect to any Units owned by the Developer) shall pay in advance on the first day of each month to the managing agent of the Property, or as otherwise directed in writing by the Developer, for use in the operation of the Property an amount equal to the product obtained by multiplying the particular Unit Owner’s percentage interest in the Common Elements times the cost of operating the Property for such month, as estimated by the Developer. Such operating costs shall not include capital expenditures, reserves for contingencies or replacements, prepaid items, or inventory items to the extent attributable to subsequent periods. If the Developer shall underestimate or overestimate such operating expenses in any month, appropriate adjustments may be made in the estimate for the succeeding month or months; provided, however, that the portion of any excess payment made by the Developer as a result of any overestimate of such expenses shall be refunded to the Developer or shall be otherwise credited to the Developer in such manner as it may determine. Section 9. Any first mortgage or first trust deed made, owned or held by a bank, savings and loan association or insurance company, and recorded prior to the recording or mailing of a notice by the Board of the amount owing by a Unit Owner who has refused or failed to pay his share of the monthly assessment when due shall be superior to the lien of such unpaid Common Expenses set forth in said notice and to all assessments of Common Expenses which become due and are unpaid subsequent to the date of recording of such first mortgage or first trust deed; provided, however, that after written notice to the holder of any such mortgage or trust deed, such mortgage or trust deed shall be subject to the lien of unpaid Common Expenses which are due and payable subsequent to the date when such holder takes possession of the Unit, accepts a conveyance of such Unit, or has a receiver appointed in a suit to foreclose the lien of such mortgage or trust deed. Section 10. At the time the sale of each Unit is closed, the new Unit Owner shall pay to the managing agent, or as otherwise directed by the Board, the first monthly assessment for his percentage of the Common Expenses, and an amount equal to three times his first full monthly assessment which amount shall be used and applied as an operating reserve for expenses and start-up costs. The amounts so paid by Unit Owners for operating reserves and start-up costs, together with amounts paid from time to time by Unit Owners for monthly assessments and supplemental assessments shall be held and used and applied from time to time for the payment of expenses as needed. All such amounts on hand shall be deemed to be part of the Common Elements and owned by the Unit Owners in accordance with their respective percentage of ownership of the Common Elements. Section 1. The use, maintenance and operation of the Common Elements shall not be obstructed, damaged or unreasonably interfered with by any Unit Owner, nor shall anything be stored in the Common Elements without the prior written consent of the Board except as hereinafter expressly provided. Each Unit Owner shall be obligated to maintain and keep in good order and repair his own Unit and his Limited Common Elements and his windows and doors. Section 2. Nothing shall be done or kept in any Unit, Limited Common Elements or in the Common Elements which will increase the rate or insurance on the Building, or contents thereof, applicable for residential use, without the prior written consent of the Board. No Unit Owner shall permit anything to be done or kept in his Unit, Limited Common Elements or in the Common Elements which will result in the cancellation of insurance on the Building, or contents thereof, or which would be in violation of any law. No waste shall be committed in the Common Elements. Section 4. No animals, rabbits, livestock, fowl or poultry of any kind shall be raised, bred, or kept in any Unit or in the Common Elements or Limited Common Elements except that two household pets, each under forty pounds, such as dogs, cats, or other household pets may be kept in Units, subject to rules and regulations adopted by the Board, provided that they are not kept, bred, or maintained for any commercial purpose; and provided further than any special pet causing or creating a nuisance or unreasonable disturbance shall be permanently removed from the Property upon 14 days’ written notice from the Board. Section 5. No noxious or offensive activity shall be carried on in any Unit in the Common Elements or Limited Common Elements, nor shall anything be done therein, either willfully or negligently, which may be or become an annoyance or nuisance to the other Unit Owners or Occupants. Section 6. No clothes, sheets, blankets, laundry of any kind or other articles shall be hung out or exposed on any part of the Common Elements or Limited Common Elements. The Common Elements and Limited Common Elements shall be kept free and clean of rubbish, debris and other unsightly materials. Section 7. No “For Sale” or “For Rent” signs, advertising or other displays shall be maintained or permitted on any part of the Property except at such location and in such form as shall be determined by the Board and except as Declarant is permitted under Section 8. Section 8. During the period of construction of any Building on the Property or any Additional Land, as defined in the Declaration, by the Declarant, the Declarant and its contractors and sub-contractors, and their respective agents and employees, shall be entitled to access, ingress and egress to said Building and the Property as may be required in connection with said construction. Until all of the Units have been sold by the Declarant and occupied by the purchasers, the Declarant may use and show one or more of such unsold or unoccupied Units as a model apartment or apartments and sales office, and may maintain customary advertising signs in connection therewith. Section 9. No Unit Owner shall overlook the electric wiring in the Building, or operate any machines, appliances, accessories or equipment in such manner as to cause, in the judgment of the Board, an unreasonable disturbance to others. Section 10. Trash, garbage and other waste shall be kept only in sanitary containers, and shall be disposed of in a clean and sanitary manner as prescribed from time to time in rules and regulations of the Board. Section 12. Garages shall be used only for the storage of motor vehicles and other customary storage purposes. Such use shall be in a neat and clean manner inconsistent with their purpose as residential garages accessory to home ownership. No storage in driveways shall be permitted. Section 13. A portion of less than a whole unit shall not be rented, and no transient tenants may be accommodated. Section 14. Each Unit shall be used only as a residence for a single family and shall not be used for any other purpose, including home occupations as defined in the applicable governmental ordinances, laws and regulations. Section 15. The provision of the Illinois Condominium Property Act, the Declaration, By-laws, other condominium instruments, and rules and regulations that relate to the use of an individual Unit or the Common Elements shall be applicable to any person leasing a Unit and shall be deemed to be incorporated in any lease executed or renewed on or after July 1, 1995. These By-laws may be amended or modified from time to time by action or approval of the voting members having at least 66 2/3% of the total votes, provided, however, that no provision in these By-laws may be amended or modified so as to conflict with the provisions of the Condominium Property Act or Declaration. Such amendments shall be recorded in the Office of the Recorder of Deeds of the county wherein the property is located. These Bylaws shall be construed in accordance with the definitions, articles and provisions of the Declaration and the Illinois Condominium Property Act, and the Declaration is incorporated herein by reference. part of the Southeast Quarter (1/4) of Section Nine (9), Township Forty-Four (44) North, Range Two (2) East of the Third (3rd) Principal Meridian, the Plat of which Subdivision is recorded in Book 40 of Plats on page 92B in the Recorder’s Office of Winnebago County, Illinois. Situated in Winnebago County, State of Illinois. 89˚22’52” East, Four Hundred Sixty-Four and Nineteen Hundredths (464.19) feet along said North line to the place of beginning. Situated in Winnebago County, State of Illinois.